Cover Title: "Deadly Is Diamondhead!" Story Title: "Fists Of Diamond - Heart Of Stone"
Nova crashes through a brick wall to stop a weapon-smuggling ring run by four super-villains! The quartet is no match for an angry Human Rocket! After a brief but intense battle, Skullcat, Sureshot, Deadhead and Kid Quarry are unconscious at Nova's feet. Moments later, Nova's allies, the New Warriors, arrive to find they're too late to help in the capture. The New Warriors' leader, Night Thrasher, angrily reminds Nova that they are a team and were supposed to follow a plan. The Human Rocket apologizes and begins to tell his teammates about a situation which is bothering him. The discussion is interrupted when they realize the weapons the villains were trying to steal must be disarmed right away. Meanwhile, one of Nova's foes, the Corruptor, is watching video of a mysterious assailant. The shadowy figure is the same man who earlier murdered Mr. Benchley. The man is revealed to be a professional hitman and is impervious to bullets. The video also shows the stranger's strength as he throws Mr. Vanetti from a twenty story window. Mr. Vanetti was an associate of the Corruptor who feels the need for revenge. He recognizes the mysterious figure and decides to use Nova Express to deliver his "message". Nova arrives at a warehouse to unknowingly deliver the Corruptor's "message". After entering the building, he realizes the package is meant for Arch Dyker a.k.a. Diamondhead! The package explodes and blasts Nova out of the building! He notices another body flying out of the warehouse and rushes to save him. At the last moment, Nova realizes it's Diamondhead himself! The Human Rocket furiously begins to pound Diamondhead through buildings. Nova swears Diamondhead will be brought to justice for betraying Xandar in the Skrull/Xandar War. He continues his onslaught with a powerful optic blast and body slam into the pavement. 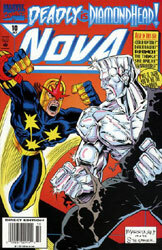 With Diamondhead down, Nova prepares to take him to jail. Suddenly, his diamond-skinned foe mentions the words "Epyrus 7". At first, Nova has no idea what Diamondhead is talking about. Then, repressed memories begin to surface and overwhelm him! He remembers the sight of dead Nova Corpsmen and a young woman in battle with him. His recollection's incomplete but it's enough to remind Nova that he and Diamondhead were both there. Nova's foe takes advantage of his confusion to escape. While chasing his foe, Nova runs into another super-villain, the Rhino! The force of the impact knocks Nova through the air. By the time he flies back, the horned criminal has been knocked out by a fellow hero; Darkhawk. Nova decides he needs help in recovering his lost memories. He turns to his allies in the Fantastic Four. At the FF's headquarters, he is met by the Thing and She-Hulk, who was doing some legal work for the FF. In a hidden complex, the mysterious trio responsible for Nova's recent adventures are arguing amongst themselves. The woman named Thera informs the others, Maxoff and the Planner, of her "new friends". Suddenly, Nova bursts into the room but is quickly blasted by an armored man. It turns out to have been a robot, not Nova, who came crashing in. The armored man is revealed to be the Fantastic Four's arch-enemy; Dr. Doom! By his side are the rest of Thera's "friends"; the gamma-ray powered Hulk and the winged Dragon Man! Thera states Nova's destruction is now assured.